Born at Sandhurst, Victoria Albert Steane attended the Gravel Hill State School until the fourth class, then transferred to the Central School 1976 where he gained the Merit Certificate. The monitor system of teacher training had been introduced and he passed fourth, third, second and first class pupil teacher. At about 16 years of age he was appointed a teacher monitor at £12 per annum. Albert Steane was awarded the Teachers' Certificate of Competency in 1897. He was the first headmaster of the Ballarat Technical School, and opened the Sloyd (woodwork) Centre in 1902 at the Ballarat East Art School (later known as the Ballarat East Free Library). According to the Ballarat Courier of 23 March 1957 Steane established the Ballarat Junior Technical School (BJTS) in February 1913, which was to become part of the School of Mines and Industries Ballarat (SMB). The beginning classes with 86 pupils were held at a temporary site at the Dana Street School. Classrooms were so scattered that Steane recalled without his motorbike he would never have covered the ground! 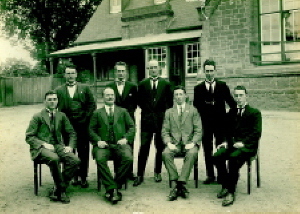 By 9 September 1921 the Junior Technical School Building was officially opened on the site of the old gaol. In a confidential report of 1916 Steane was described as one of the best organisers in schools at that time, and he was noted for his strong but fair discipline. In the 1926 school report the Chief Inspector wrote that 'no boy is neglected'. 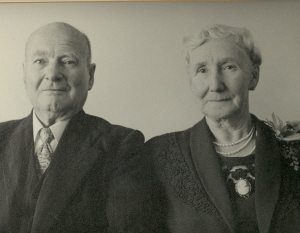 Steane held the position of headmaster at the Ballarat Junior Technical School for 29 years retiring on 16 April 1942. Steane is known for the teaching of Sloyd or woodwork, which was an important point in his career, and for his love of gymnastics. He was made a life member of the Ballarat Y.M.C.A. in 1968 aged 91 years. 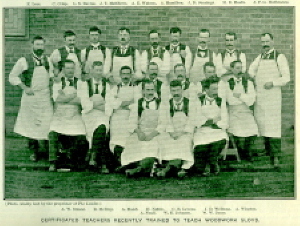 The teaching of woodwork in Victoria began in 1901 and Steane was chosen, among 18 others for the inaugural training course at Queensberry State School in Melbourne. Because of his lifelong love of gymnastics Steane organised a gymnastic display for the Education Department in 1902 at Bendigo's Golden Jubilee Exhibition. He was one of those instrumental in establishing the Ballarat Y.M.C.A. and directed its physical culture evening classes in 1906. In 1908 Steane toured the world visiting the Swedish Naas Institute and the Gymnastic Festival in Germany. Steane in his reminiscences recalls: "In 1908 I obtained leave of absence and undertook a world trip to further my knowledge of both manual art training and physical training. On this trip I visited U.S.A., Canada, Scotland, England and Europe. Notable events were the attendance at the great 11th Deutsche Turnfest at Frankfurt, inspection of the Naas Training School for Sloyd at Naas, Sweden inorgorated [sic] by Otto Solomon, and attendance at Physical Education Demonstrations at London given by the Swedish institution. These P.E. demonstrations were given to assist the organisation and introduction of P.E. training in London schools. On returning to Ballarat I resumed my position at the Ballarat East Sloyd Centre and continued my studies at the Ballarat Art School gaining the Drawing Teachers' Certificate." Steane died, aged 93 years, on 13 July 1970, at Sydney, leaving his widow Grace Elliott Steane and children Eric and Violet. This biography researched by Dorothy Wickham, December 2005.